You’ve wondered, worried and waited all week to hear about your child’s stay at camp. The anticipation to hear stories about friends they’ve made, activities they’ve done and experiences they’ve had is unbearable. It’s Saturday morning, their bags are back in the car and their tired little bodies are plopped in the back seat. As you head down the dirt road and the dust settles on your back window you ask, “So, how was your week at camp?” and all you get is “It was good.” You try again. "What did you do?" To your utter disappointment you get with baited breath, "stuff." GOOD?! STUFF?! You know for a fact your child had first time experiences like riding a horse, swimming in a lake and camping under the stars. You watched a slide show where you saw kids singing, dancing, covered in mud and spaghetti and climbing a 50-foot tower. How could your child’s answer to what seemed like the most amazing and exhilarating week just be “fine?” Don’t worry, it was in fact, an incredible experience that they will never forget. The problem is not with their week at camp, it is with their inability to put it all into words. 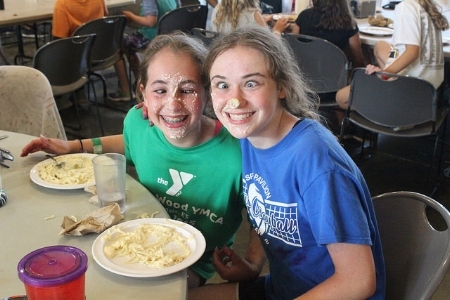 So, let us help you help your camper verbalize their once in a lifetime experience at camp. Step 1 – Give them some time. They ran all day, every day from program to program. They constantly had to step out of their comfort zone to meet new people and try new things. They stayed up late, woke up early and sweat all day. They are exhausted. If they aren’t quite ready to talk then offer up a pillow and maybe their favorite music and let them take a nap. Step 3 – Ask camp specific questions. 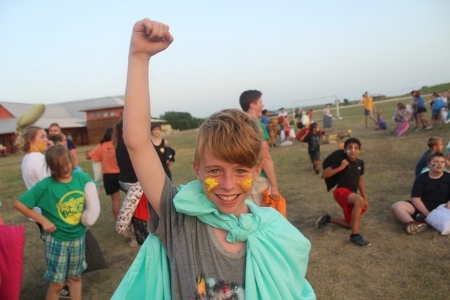 How do you sum up a week of camp in one word? If you are a young camper, it will mostly likely be good, fine or maybe fun. Try out some of these more camp specific questions to spark some more interesting conversation. 1. Who were your favorite counselors? 2. What skill builders did you sign up for? 3. Did you see any shooting stars or hear coyotes on your campout? 4. How messy did you get during forkless spaghetti? 5. What was your favorite act at the talent show? 6. Did you have a favorite camp song that you learned? And will you teach it to me? 7. What carnival game did your cabin organize? 8. Did you meet any new friends? 9. What is Meal Time Mockeries? 10. Did you meet someone from a different country? 11. What was the name of the horse you rode? 12. What things do you want to try when you go back next year? Hopefully, these questions will spark even more great conversations between you and your camper about their experience. Step 5 – Be patient. If you still aren’t hearing much on the first day just give them some time. It might take a while to process everything they have done and experienced. Don’t be surprised if throughout the rest of the year you hear random stories about seeing whiffles or suddenly hear them yell “TOAST!” while they are making their breakfast one morning. It may not always make sense to you but to them it’s a memory of an experience they will never forget. It’s their way of saying thank you for providing them with a treasured and life-changing opportunity.